We are a boisterous bunch, with faces and histories from all over the world. I and another hundred or so folks shuffle our way through line up after line up, clutching the required documents – proof of citizenship and two recent photos. None of us was born in Montréal but we’re here now and we want to learn French, the language of public life in Québec. Luckily the government wants us to learn too, and sponsors free language schools like this one. Pastel pink and yellow walls, knee-high water fountains; I imagine this old building hasn’t changed much since it was an elementary school. Radiators overheat the small gymnasium where we wait with heavy late-autumn coats slung over our arms in a registration process that takes hours. A piano sits in one corner. Colourful posters of Québecois films and singing stars adorn the walls. Taped up amidst them, so small they are hard to read from afar, printed humbly on 8 x 11 paper, are little quotes from former students. Each is a reflection on what it means to learn. Awareness. Immensity. Possibility. I wonder if Monika was a student of yoga philosophy as well as French. In any case, her reflection gives me a moment of peace and wonder as I stand nervously in the second-to-last queue. I’m about to take a spoken exam that will determine which language level I’m at. And even though this is a school, where the goal of learning is explicit and none of us would be here if we already knew the language well, I still feel that I’m about to be judged. Until I moved to Québec, most of the French I knew came from the back of cereal boxes. You can only go so far with a linguistic arsenal of «source de fibres naturelles» and «conserver en lieu frais.» Of course, there were also the couple of hours of French per week in high school, where I learned my merci’s and de rien’s. What I didn’t learn was French as a living, uttered, spoken language. Luckily I found myself amidst a warm community of francophones soon after I arrived in Montréal. Over countless summer pique-niques and winter dinner parties, the musical sounds coming out of people’s mouths turned into comprehensible language. I owe my understanding of French to my friends and their willingness to put up with my mute yet attentive presence. But to learn to speak, well, for that I have to speak. This means trial, error and making mistakes. The examiner is tired but kind. She asks me questions like what I was doing at precisely five o’clock the previous day (cutting my own hair) and where I’ll go later this evening (to a screening of local short films). My mouth is dry and my voice weak, but I also feel a thrill at jumping in where I normally hold back. La colonne vertébrale, la respiration, l’esprit, la conscience. Relâchez-vous. I am cozy on the couch with a favourite book, the French-English dictionary, researching yoga vocabulary. Spine, breath, mind, awareness, relax. As the language course begins, I’m also starting to teach Hatha Yoga at Petites-Mains, a community organization that helps immigrant women integrate into Québec society. I found Petites-Mains when I was looking for a place to volunteer and practise my new language skills. The organization attracted me because of its practical focus – training women and getting them jobs – and because it was started by a nun. The managers at Petites-Mains agreed that yoga, with its physical and spiritual benefits, would be a good addition to the program, if I could teach in French. I dive into planning my class, excited to discover new words. I make lists of poses and translate them. I draw a labeled diagram of the human body to get my anatomy down pat. My head swirls with words, but they’re all individual, still separate, so I get off the couch and spread out my yoga mat. I run through a gentle Hatha class, imagining I am both teacher and student, jotting down the phrases I say naturally when I teach in English. There is so much more to leading a yoga practice than simply telling students what pose to do next, just as there is more to language than isolated words and verbs correctly conjugated. What is it that makes a yoga class flow? What is the connective tissue of a language? I look at the pages of phrases I’ve written, overwhelmed. Teaching comes so easily when I am speaking English. How can I possibly offer the same level of subtlety in this second language? I want to give the people at Petites-Mains, who are new to yoga, a good taste of the practice. It’s disappointing to think that the classes might be limited by my lack of ability in French. juniper glass is a Montréal writer, community worker, and yoga student and teacher. 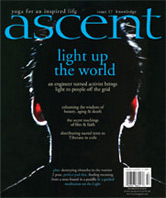 Her past articles have been published in ascent and Utne. She is currently initiating a project to make yoga more widely accessible in the community. She lives happily in a small but sunny apartment with Silvie, Roger and Twiggy. Reach her at juniperglass@hotmail.com.